I tore through the original FEAR, very much liking it despite a number of issues. The expansions were so dull I stopped an hour or so in, and a large part of that decision was the already installed sequel, which I was eager to get into. 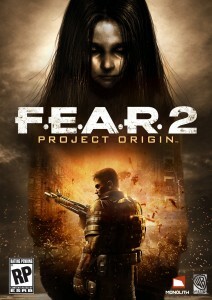 FEAR 2: Project Origin (likely the dullest subtitle to ever grace a game) is all about smooth, empowering, flowing action – like the original, but better in every way. It’s much more colorful than the original, which is nice. In terms of just shooting, moving, tactics and pacing, this is a very accomplished shooter. The first game’s biggest sin were the dull, confusing environments. They are still very mundane, dull and repetitive to go through, confusing in their sameness. You feel banal examining them, they undermine the explosive action. The intention may have been to contrast the outlandish action, but it just doesn’t work. It does get better (the school is full of character), and there are highlights (loved the riff on monster closets! ), but every time I get to a new location, I find myself hoping that maybe it won’t be underground and all straight edges. Often my only way to tell I’m going in the right direction is an autosave triggering. But “psychological horror”, really? High on atmosphere, somewhat on tension, low on horror or even scares. I don’t mind, really, but it’s worrisome if this is someone’s definition of horror, let alone “psychological”. Bloody mutants jumping in your face and messages written in somebody’s entrails are body horror, not psychological. I know it’s marketing, but it’s all part of the experience. Don’t sell me something you’re not. In terms of gameplay, the game’s only crime is its attempt at adding depth and atmosphere by way of introducing collectibles. These are constant flow and immersion breaking, mandatory jumps into the menus, reading text that’s not optimized for high resolution, bothersomely large on a computer screen. I haven’t read any of them so they may be really good, but the way they’re presented, they feel like an irritant. Also, “you’re like pizza in an anime convention to her”? Not something I want to hear ever again. Now that’s psychological horror.